Sate Padang Pariaman - Sate desert has many kinds. There is a long satay padang, padang satay, and satay pariaman. But from the third satay, satay very unique and most preferred by connoisseurs Pariaman satay satay padang. With article Recipes Make Delicious Original Sate Padang Pariaman, I would invite you to try and enjoy satay padang pariaman in your respective homes. 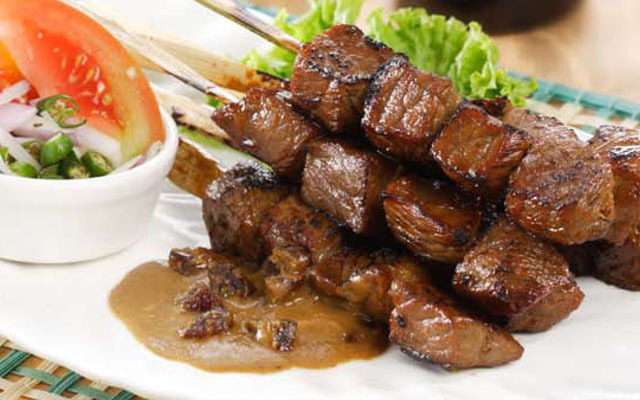 Obviously, Recipes Make Delicious Original Sate Padang Pariaman is very easy and practical for you to try. Boil beef brisket with water until cooked and tender. Lift. Cut into 2x2 cm. Measure 1000 ml broth. Boil meat with bowel, ground spices, turmeric leaf, lemon grass, and Kandis acid. Cook until the broth to 500 ml with a small flame. Prick-puncture flesh, and intestines alternately on skewers. Burn until fragrant. Boil again the rest of the stew. Thicken with rice flour solution. Cook until bubbling. Add peanuts. Stir well. Lift. Serve with satay sauce and a sprinkling of fried onions. 1 Response to "RESEP CARA MEMBUAT Sate Padang Pariaman DENGAN MUDAH "